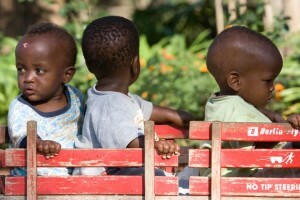 Just down the road from the Seed of Hope Orphanage is the Seed of Hope Academy. 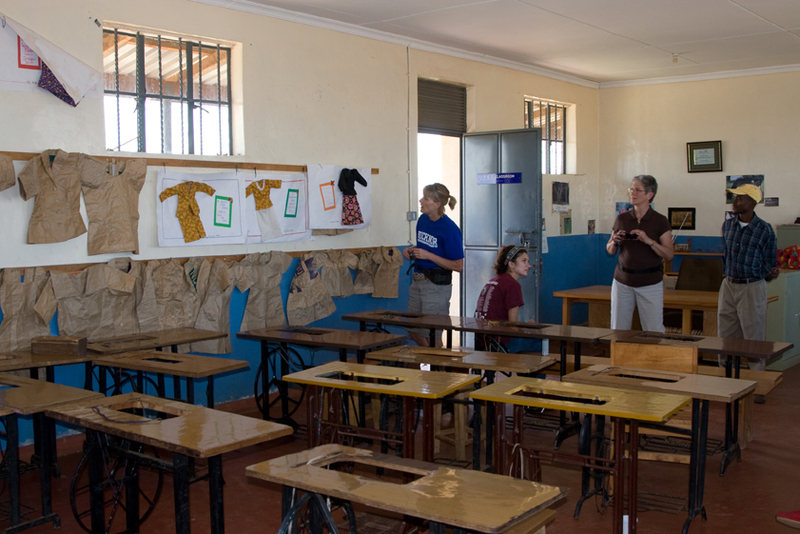 This is where the orphans attend school, along with many other kids from the area. At the end of the school day the kids gather around the flag pole for a closing session of singing and announcements. I will be traveling back to Kitale, Kenya, come March 11th! For perspective, I have been able to visit two main groups of kids during my travels to Kenya. The primary group (the one I've visited the most) is from the Baptist Children's Center in Nairobi. When I travel in December, as I've done four times, these are the kids I get to see. The second group is from the Seed of Hope orphanage in Kitale, a town located in western Kenya near Uganda. I have been to the SOH twice - three days in December 2008, and an afternoon and morning (took a side trip) last December. The Seed of Hope is a larger orphanage, hosting 60, 70, 80 kids, maybe more...I'm not quite sure. I also believe it is the more rudimentary of the two, less developed in terms of foster/kinship care, etc. They have less space for more kids, fewer beds...you get the idea. But fear not! The staff I have met there on my two previous trips are absolutely amazing. As has been my experience with Buckner, there are very competent, caring staff surrounding these kids. Fine people looking after their health, their education, their spiritual life, their needs. Good, good people. And great kids. I am beyond excited to see these kids again. I just saw many of them in December and am thrilled to be going back so soon. I'll update the old blog as time draws near, and hopefully while I'm over in Kitale. Not sure what kind of internet access I'll have, but I'll do what I can. 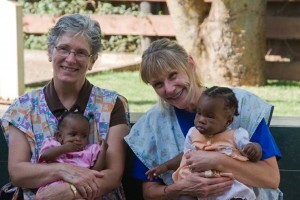 Our last day prior to the safari featured two quick stops: The BCC campus and the New Life Babies Home. I have written quite a bit about the BCC, so I'll keep it short. 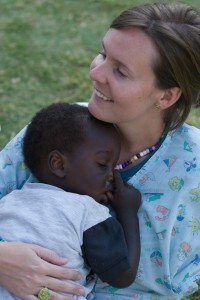 Buckner began operations in Kenya in 2002 with the assumption of the Baptist Children’s Center (BCC) located in the Njiru location of Embakasi Division, Maili Saba Village. In 2001, Arms of Jesus requested Buckner assume responsibility for operations of BCC. Actual ownership of the campus remained with the Baptist Association of Kenya as it does to this day. 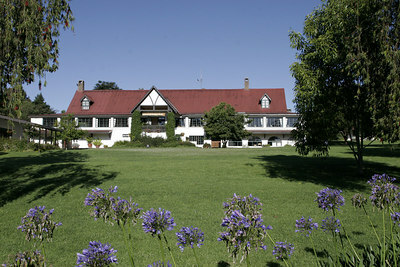 The Manager’s house and cafeteria buildings were added in the same year. 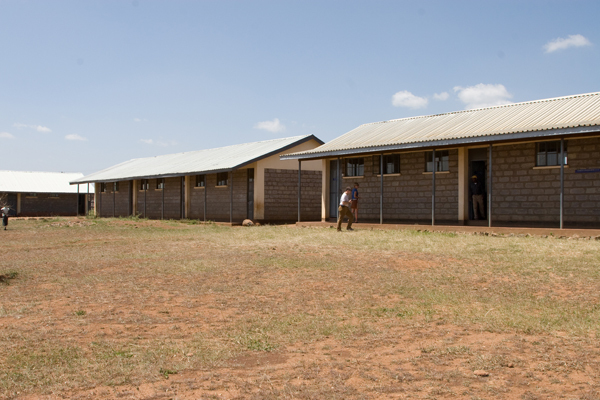 They were followed by the girls’ and boys’ dormitories in the following year and in 2004 the first two education buildings were added with one for the preschool and kindergarten while the other for the technical training program. In 2006, construction was initiated for expansion of the BCC school with the goal of expanding through the 8th grade. Completion of the 1st through 4th grade building was finished in 2007. The Technology Center is used, currently, to teach sewing to young ladies. The goal of this program is, of course, to provide a marketable skill so they are able to find employment. As Tony Wenani (BCC Manager) explained to us, the girls are taught and tested up to a certain proficiency level, and then leave to find an internship or further instruction. Once this process is finished, the girls are (typically) able to find work. The photo below shows the sewing tables (with the machines removed and locked away). It was a quick tour of the BCC, but as always I was very impressed with the facility, the program, the commitment of the staff...everything. It was good to see Tony and his family, and I also got to see one of my all-time favorite kids, Charles (Charles and I have a close bond). The buildings and facilities were very, very clean and well organized. There was a critical care room, complete with incubator. There were several different "units" for different age babies. There was a room for potty-training. 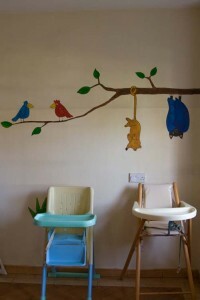 There were play rooms, feeding rooms, sick rooms...this place had almost everything you would need to raise 50+ babies. According to our guide, almost all of the staff were volunteers. People from around the globe (it seemed) would show up at the home to spend time with the babies. Administration and management staff was paid, I assume, but there were many volunteers there. 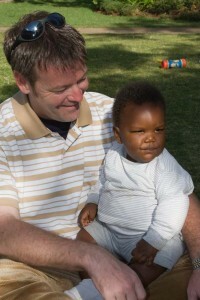 According to our guide, many of the HIV-positive babies had reverted to HIV-negative after receiving care and treatment. I had never heard of this even being possible, but our guide insisted this was case. Amazing! All in all, this day taught me (or, reminded me) amazing things are going on in Kenya. God is using all sorts of people to accomplish all sorts of things. 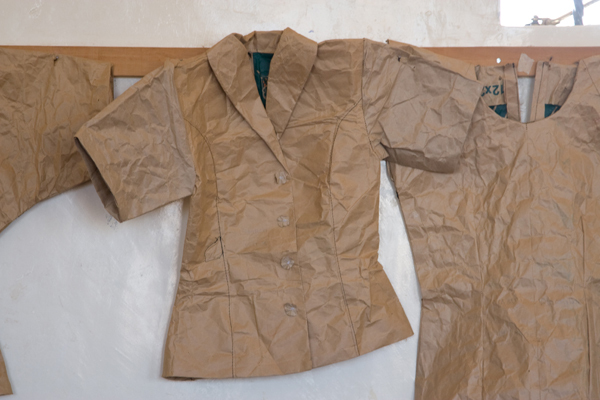 He is providing teachers and buildings and sewing machines and paper so young ladies can have a chance to earn a living. He is providing people like Tony Wenani to manage the BCC in such a way that both the orphans who live there and the surrounding community benefit. He is providing volunteers and funding and facilities and medical assistance and generous, open hearts so that abandoned babies can live. And He is, in some mysterious way, allowing these babies born with HIV to escape from the clutches of this dread disease. Yes, God is doing these things. But I am reminded time and time again that his instruments are people, and this, I suppose, is the greatest lesson I've learned. I'm a "people," you're a "people,"...we're all "people." And as such, we can, and should, all be instruments for God to use is some fashion. What a challenge, what a calling. The children love being here. The grounds are lush, with soft, delicious grass in which to roll around. There is also a playground complete with two swings, a teeter-totter, a slide and some other fun things. The food is good; much better I assume than what they are used to (they LOVE the sausage!) We play games, do VBS activities, hang out to talk...pretty sweet time for them. We even watched "The Polar Express" last night (Tuesday), and they loved it. They have so much fun, in fact, it is easy to forget the stories behind the faces. As great as the BCC kids have it when at Brackenhurst, and as good as they have it at the BCC itself (relatively speaking), I try not to forget these children are still some of the more disadvantaged children in the world. As I, and the group, keep this in mind, I struggle to do what I can to make a positive difference in the short time I have. As opposed to the kids in Kitale at Seed of Hope, the BCC kids have spent time with many groups, and seem a touch less responsive to us. As someone who works with kids for a living, I certainly recognize, and understand, the "been there, done that" feeling some of the BCC kids might have (you can only make caterpillars so many times before the novelty wears off.) However, I do have faith our presence with the kids does them some good. I think, if nothing else, they benefit from knowing people care about them, knowing they are thought special. As I've written before, it's never a bad thing to be loved. At the end of the day, despite the potential for "group burnout", I truly think the BCC kids really enjoy us coming to see them. Good food, fun, games, gifts...can't be all that bad! In addition, all of us in the group have connected with at least several kids, forming deeper relationships, and hopefully these relationships will produce meaningful differences in the lives of the children. - The trip home. Some of the group are leaving early (skipping the safari) and travel is always a concern. - The BCC caregivers and social workers. These are the people who are with the kids day in and day out, doing their best to raise the 65 children under their care. These young people have more responsibilities than could even lift, yet they always smile, they always praise God, and they always seem joyful. - Dickson: He has spent enough time away from his family. He usually doesn't spend so much time with the groups, but his assistant - Tom - just recently got married and has been unavailable. Dickson has gone above and beyond the call to look after our group every step of the way. - The children. Where to begin... I love them as if they were my own, and I want the very best for them. They have so little in so many ways it just kills me, leaves me lying in bed at night staring at the ceiling. Pray for their health, their happiness, their schooling. Pray each child will soon find themselves in a foster home which will nurture, encourage and love them. Pray for them to find peace and joy. Well, we made it. Our trip over was amazingly trouble free: no lost lugguge, no missed connection in London (despite departing late from Dallas), nothing unusual, really. One trip participant suffered a pretty ugly bout of airsickness but bounced back like a trooper. The flight didn't seem as painfully long, either. It was 8.5 hours (or so) from Dallas to London, a quick layover in the London airport, and another 8.5 hours to Nairobi. We left Dallas in the late afternoon on Wednesday, arrived in London very early in the morning Thursday, and finished up in Nairobi late that evening. All in all, British Airways did a good job getting our group over to Africa. We spent Friday at the Seed of Hope children's center conducting VBS for the children...about 115 of them. (I will write about the children later, as time is limited and internet is painfully slow.) We had a great time doing Bible Story, Memory Verse, Crafts and Recreation. Carson, Hilary and I ended up on the same team (Green Team!) which proved to be a lot of fun. Our kids ranged in age from 7 to 10 years, and were absolutely, amazingly precious. We all fell in love immediately. Saturday, we returned to Seed of Hope for our second day of VBS. Again, our kids were great. They are so kind and polite, smart and respectful. At time, a little chaotic, but always fun. We played some great games of Duck, Duck, Goose, Red Rover, and others...all with a delightful Kenyan twist. By the end of this day the kids were really warming up to us, relationships were forming, and opportunities to really enter into the childrens' lives were becoming available. Again, I'll talk in more detail about the kids later. Sunday was our last day at the Seed of Hope. We made our way to the center, met the kids and walked to church with them, about 1/4 mile. The service was truly fascinating and amazing. I will post some video at a later day (low quality...taken with my cell phone.) Afterwards, we toured the school the children attend and then made our way back to the center for games and lunch. Finally, we were able to pass out presents to the kids. They absolutely loved getting their gifts! It was very touching (and sobering) to watch the kids with their new toys and games and stickers and candy. It is very obvious that for children who don't have anything, it doesn't take much to make an impact. The hardest part so far, of course, was saying goodbye. After gifts and a short, final time of hanging out, we climbed into our vans and left the Seed of Hope. It is so very hard to leave after such a short time, but we are all thankful for our time with the children, and I personally believe our time there was a positive thing in their lives. Please pray for the children of the Seed of Hope Children's Center. Our team is doing well, for the most part. One participant is somewhat sick and may have to return, and we are all tired, but for the most part hanging in their. Carson, Hilary and myself are all doing wonderfully. Continue to pray for the group, if you would. Well, that's it for now. I will try to provide another update soon.